Your Helix and Insitome account's are two different accounts. You must register your Helix kit before you can setup an Insitome account. 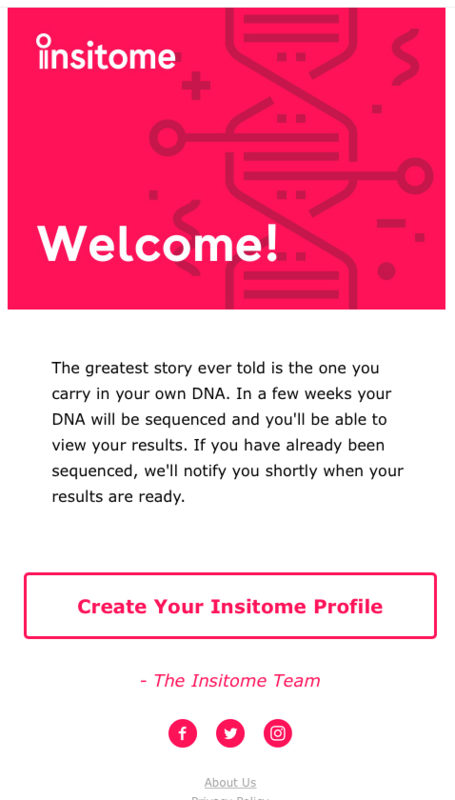 If you have made your first purchase with Helix (DNA kit + application), you will receive a welcome e-mail from Insitome after you register your Helix kit at store.helix.com/start. If you have already been sequenced and are buying an Insitome product only, you will receive a welcome e-mail from Insitome shortly after you complete your purchase. Click on the "Create Your Insitome Profile" button and you will be taken to a page where you can setup your Insitome account. If you are unable to find the Insitome Welcome e-mail, you can visit the password reset page and enter in the e-mail address you used to create your Helix account. You will then be sent an e-mail to "reset" your Insitome password after which you can log in and setup your Insitome profile. Please note that setting up your Helix account will not automatically create an account for Insitome. Also, you must use the same e-mail address associated with your Helix account for your Insitome account. If you need additional assistance, please contact us at help@insito.me.